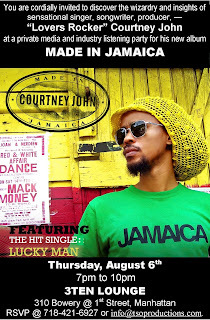 Brooklyn, N.Y. July 23, 2009…Courtney John’s recently released album Made in Jamaica is poised to catapult his career, as the artiste sets his sights on the international mainstream market. February 2009 found the singer/producer/songwriter on tour in the U.S with progressive rocker Michael Franti and his group Spearhead. Courtney John’s wizardry and insights as a sensational singer, songwriter and producer will be displayed to the New York media and industry at a private listening party on Thursday, August 6th in lower Manhattan. MADE IN JAMAICA, Courtney John’s third album is a quintessential lover’s rock collection. Released on June 17, 2009, the album features 12 diverse tracks from the works of such noted producers as Sly & Robbie on the super sensuous Ready to Go and the slamming one drop sounds on, Back Into Love; Steven “Lenky” Marsden’s three techno-dancehall tracks Float, Safer Place and Save Us All; Chris Peckings with the vintage Treasure Isle sounds on Lucky Man and Win Some and of course Courtney John himself on a series of stirring love anthems including Miss You, One and Forever. Lucky Man the first single from the album, often called “refreshing” is steadily permeating the airwaves worldwide with its vintage Treasure Isle feel. The song has quickly become a local and international hit. Lucky Man the video was released on June 19 on Jamaica’s popular television program, Entertainment Report (E.R). The period piece exceeded expectations and is being viewed regularly on Youtube. The revolutionary Lucky Man video colored in black and white portraying an old school vibe set in the 1960’s was directed by the renowned Ras Tingle. Visit www.courtneyjohn.com to view the video. The general public can experience Courtney John at an after party celebrating the launch of GOOD LIFE and Jamaica’s Independence Day. The festivities take place at 3Ten Lounge, 310 Bowery at 1st Street from 10pm. This event is open to the public with a RSVP/$10 cover charge. DJ Stranger will be spinning, Reggae, Soca, R&B, Hip Hop and more. For information call 917-804-4820. To schedule an interview with Courtney John, call 718-421-6927 or email info@tsoproductions.com.